At DOmedia, out-of-home media excites us. We love all the ways it’s being used, the trends, and the ways it’s changing. That’s why we’re always staying up to date on the latest and greatest. To share the OOH love, we like to round up our favorite news, trends, insights and general fun around the OOH world. This month, we’ve got a special treat for you: we’ll be focusing on the future of OOH, and what this month has shown us about where it’s headed. Let’s face it, too many people think that out-of-home = billboards = old and boring. But take a closer look, and that couldn’t be further from the truth. Bring on the future, because it looks pretty bright to us. Yes, you! Nancy Fletcher, of the OAAA, sat down with leaders of 50 outdoor advertising companies. Where is the OOH industry now, where is it headed, and how do we get there? Nancy gives us insight in this OAAA special report. 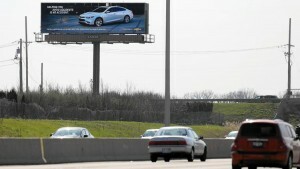 Alternative OOH media is one of the most exciting areas in this industry. Novel new ideas are popping up every day, giving advertisers new, creative ways to reach their audiences. Man, the future is cool! This new idea comes all the way from Amsterdam. When there are enough listeners to a certain radio station, digital billboard buys are triggered to line up with a radio spot. It’s new, and still needs to be developed further, but it’s an exciting look at how people are working with OOH’s full potential. Speaking of the future, the future is programmatic. At least according to five industry experts, who discuss what programmatic really means, how it can be used in OOH, and how the industry can work toward that ever-shining goal. This from across the pond: UK media agency executives expect DOOH to be the fastest-growing channel in the next five years. That’s above mobile, video on demand, and every traditional channel. The same executives rate DOOH as the most dynamic, exciting, modern, and versatile. The FBI is partnering with advertisers to help track down the worst criminals in the country. Even the FBI has to deal with message clutter– people just aren’t motivated to act on old-school wanted posters. Enter DOOH, and displays in high-traffic areas that can be updated in an instant. The Traffic Audit Bureau used the TAB/OAAA conference last week to announce its rebranding as Geopath. According to now-Geopath’s new president, Kym Frank, the old name was “a really awful name that made her think of a guy with a clicker, standing in front of a billboard counting cars.” Fair enough. Kym has already brought sweeping changes to the nation’s leading provider of out-of-home media data and ratings, and we’re excited to see where Geopath leads the industry moving forward.